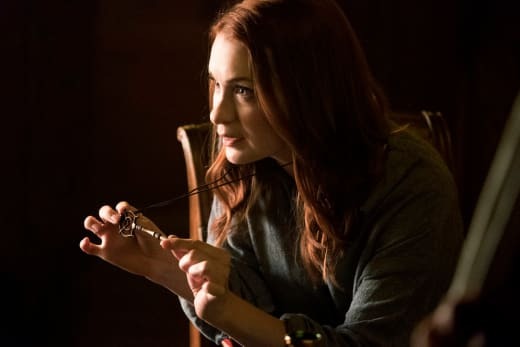 The Magicians: Felicia Day on Going Darker With Poppy, A Potential Return to Brakebills, and More! With credits on beloved and critically praised series like Buffy the Vampire Slayer, Supernatural, Adventure Time, and Mystery Science Theater 3000: The Return, Felicia Day is easily one of sci-fi and fantasy’s most recognizable faces. She’s also become a legend within the geek community, getting involved not only with fellow artists and friends’ productions like Con Man and Dr. Horrible’s Sing-A-Long Blog, but building her very own massively influential geeky empire through Geek and Sundry. 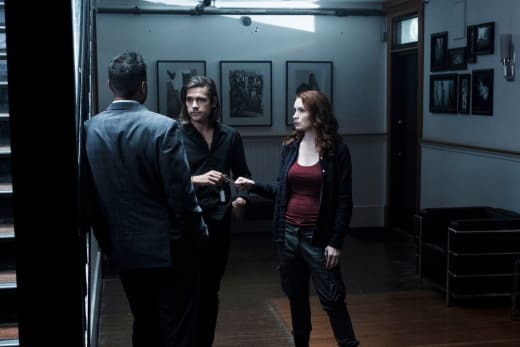 Most recently, Day had a highly anticipated guest arc on Syfy’s adaptation of Lev Grossman’s popular trilogy The Magicians, which just delivered a stunning season three finale. 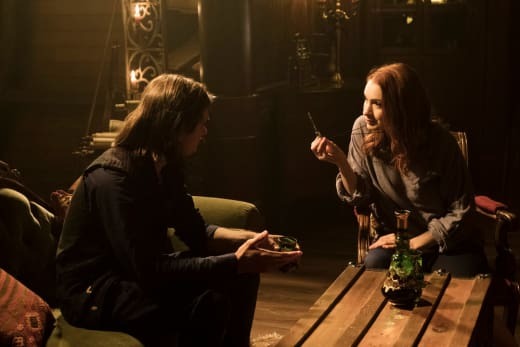 Her three-episode long appearance as Poppy – a Brakebills student trapped in Fillory’s Abyss, eventually discovered by Quentin and Benedict on the fourth key quest – was both too short, and impressively eventful. From dark, invisible voices and a visit to Fillory to dragons and love triangles, Poppy got the full character treatment. And with the help of her flashy smile, endearing nature, and clever manipulations, managed to leave a rather memorable mark on an already memorable season. TV Fanatic attended Emerald City Comic Con in early March and had the chance to chat with the actress, producer and media empire founder about her latest role. During our conversation, we covered what it was like working with The Magicians cast, whether Poppy should be trusted, exploring the spectrum of depression, and if viewers will see Day beyond Season 3. There are similarities between Poppy and other characters that you’ve played, but also a lot of differences. 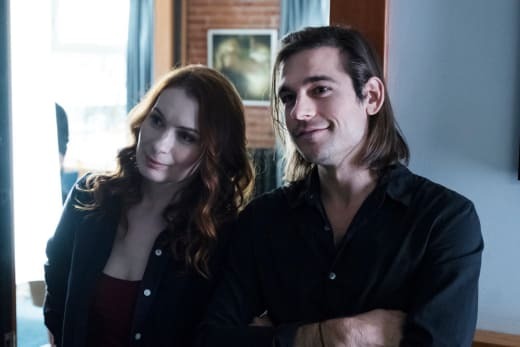 What drew you to her and The Magicians? Well, I love the show. I really like how it takes fantasy and sort of twists it, makes it a little darker, a little fresher and hipper, in a way. Quote unquote. When they asked me to do this role I was so excited because I had been familiar with [Poppy] from the books. She’s a really upbeat character, which I usually play upbeat characters, but I loved how they reinterpreted her in a little bit darker way. She has an edge to her, a lot of secrets, and there’s a little bit of a narcissistic person. I love how there are more different layers than anything I’ve ever played. She’s quite fun. Like Poppy, you were coming into an established crew of people who knew each other and I’m sure are very close. What was it like trying to fit yourself in as you’re trying to fit into your character as well? You know, whenever you’re on a new set, it’s sort of a learning curve. The first day is always very nerve-racking, but all my scenes were with Jason and Harvey – Benedict, and Quentin. It was a little bit of a smaller scale entry into the world. It wasn’t until the second episode I met a bunch of the other characters. It was a little bit easier to slip in. Jason [Ralph] is such a gentleman. You can tell a really great actor when they work extra hard to make the new person coming in feel welcome and he did that for me. After the first scene, the first take, you’re like oh, I know how to do this and there’s great chemistry between [him and I], I think, and it came out on screen. Poppy had unique first meetings with each of the characters, but I was partial to Margo’s introduction. I mean, she’s great. She delivers the F word like nobody’s business. And Summer Bishil is one of the nicest people I’ve ever met. She doesn’t really have hard edges as a person, so I love that she definitely inhabits a different kind of character than who she is. Was there a particular character or cast interaction that you really enjoyed, outside of Jason? I mean, Jade and I really bonded because – I don’t know, I really got along with her as a person and we had a lot of scenes together in a couple of episodes. I really like her because she’s really smart. She’s a writer and a musician. She has a really interesting background and I love that she really has this cool, New York vibe to her that is very exotic to me. So we get along really well, in particular. But all of them are really nice. I love watching Hale just drape himself over furniture. I’ve never seen anybody look like he was on a chaise lounge in a director’s chair before. It’s just hilarious. You are a bit of a dragon lover, so did you have to do any more research about dragons for your role? Or did Sera Gamble and John McNamara just give you everything that you needed? I mean, there’s a lot on the page. I don’t think I needed to get a degree in it for the part, but I would love to research it more if there was an excuse. I know a lot about dragons, as a human being. I actually love dragons. I’m hyper-educated in Dracon-ology. There’s an illustrated guide to dragons, a beautiful book if anyone wants to look it up. The nature of The Magician’s universe really plays with trust and Poppy, as you mentioned, is somewhat narcissistic. I think many fans wanted to trust her, but there were things that she did that made it difficult. Were you intentionally playing that line, or were viewers just being somewhat paranoid about whether or not Poppy was an actual threat? I think there’s always an ulterior motive with Poppy. I think it’s there in the writing, but I think it’s really fun because for me as a person, like you said, I’ve played a lot of upbeat characters in my career. It’s kind of what I get cast as over and over, and I love the fact that this takes that and sort of twists it. You never know whether to trust it or not. I’m always the good guy, so being the dark-tinged person... there’s no completely light tinged people in The Magicians, but she has an extra twist that I think is fun and it adds so many layers to the character. You really don’t know what to expect from her, except that she’s going to protect herself. He’s always the nice guy. He plays John Cho. And there’s nothing wrong with that, you know. People want to see people play themselves or the qualities that they respond to on film. Poppy’s introduction to viewers is in an episode that essentially plays as an extended metaphor for depression. Can you talk about whether or not that theme and subject played into your embodiment of her and if so, where Poppy fell in that spectrum of experience? I think if you have your darkest self pushing you to your darkest place, you definitely have to play that. There were several scenes where I was looking behind my shoulder. Certainly, I’d given a lot of thought to who that person is and how she talks to Poppy. Obviously, a lot of people had died around her because of that key, but I think Poppy is a resilient person. I think she’d been through a lot in her life, or had that voice that’s inside her head maybe outside her head in her world. It’s not natural to be completely immune to that hole, to be depressed and be self-destructive, and I think Poppy’s somebody who has an amazing resilience because she’s learned it in her life. Poppy became somewhat of a love interest for Quentin during her arc. How much do you think that was about joining the latest quest and how much was that a genuine connection between her and Quentin? You know, I don’t know if they would have babies together. I don’t see that as a long-term proposition. I do think Quentin is obviously a very physical guy, he’s had a lot of hook-ups. I don’t think Poppy is particularly discriminating in that sense. I think she looks at this kind of like going to do some elliptical. I do think she actually surprisingly likes Quentin. I do think it surprises her that she has more sympathy to him than most other humans, but it’s not a lot, I don’t think. I think Quentin’s destined for other people, but it’s fun along the way to hang out. Related: The Magicians Season 3 Episode 6 Review: Do You Like Teeth? During the last episode of your character’s arc where they’re in the satellite library and Quentin and Alice run into each other, Poppy’s like, ‘I see this… but we got to go.’ Quentin’s decision to stay with Alice felt like the deadening of a love triangle. Is that what happened or was it something less deep? There is a moment there when Quentin chose Alice over her and in it I at least tried to reveal a moment of betrayal, because she actually had been having a lot of fun and maybe emotionally felt something -- at least friendship -- with Quentin. When she got shafted, it was like, old Poppy is back, she’s going to take care of herself. I think there was a moment there where he clearly visibly dumped her that was very hurtful. I don’t know what happened. She’s going to leave with a hand brushing, but who knows when we see her again. Hopefully, in the context of dragons, if we do. So is it fair to say Poppy is gone-gone? 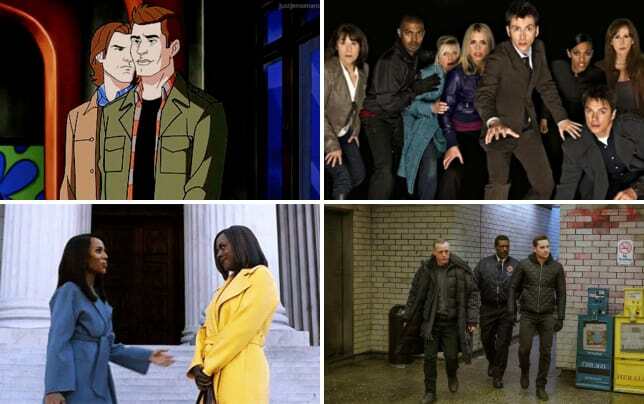 Those [were] the episodes for the season that I’m in, but you never know. Clearly, I didn’t die. It’s just something I can’t determine because it’s really up to the writers. What I love is that they make the architecture of the book fresh. If they bring me back, I’d love to come back because I really do feel Poppy. Be sure to watch The Magicians online and every Wednesday on Syfy. The Monster: Perhaps you can tell me, do I have a name? Monster's Sister: Why would you need one? If I ever get out of here Q, know that when I'm braver it's because I learned it from you. Permalink: If I ever get out of here Q, know that when I'm braver it's because I learned it from you. The Magicians Sneak Peek: Is Penny Facing Certain Death? 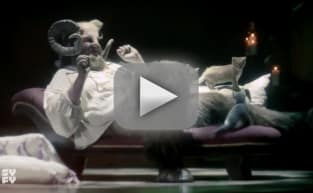 The Magicians Sneak Peek: Can Mayakovsky Save Alice?